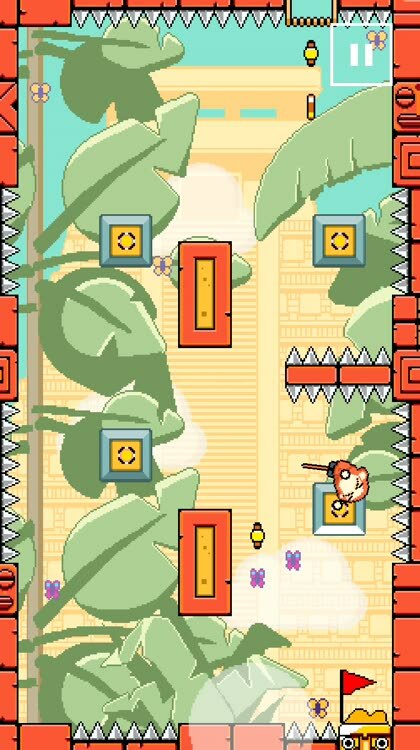 Swing King & The Temple of Bling (Free) by Shedworks Digital is a charming little action puzzle game that involves a monkey, ancient temples, and hidden treasures. 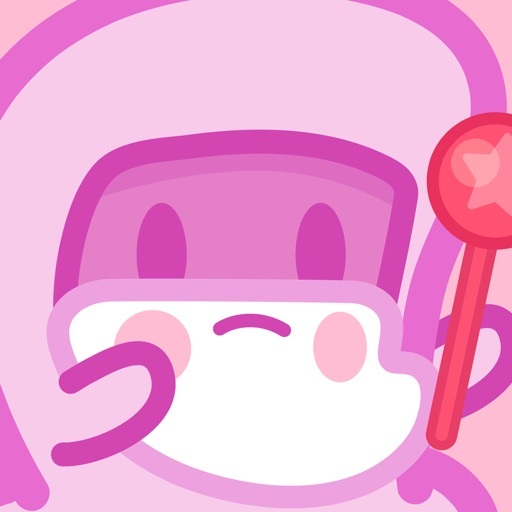 If you enjoyed games like Stolen Thunder, Breakforcist, and even Mallow Drops, then chances are high that you’ll like what Swing King has to offer. Most of the time in my life, I feel a little stressed out, even though a lot of the things I worry about are small things that I really shouldn’t fret over. But to help me take my mind off of reality for a few minutes or a few hours at a time, I sit down and play some video games, whether it’s on my iPhone, Nintendo Switch or 3DS, or my PlayStation 4. As much as I love my consoles, I still end up killing time mostly on my iPhone as I have it on me all the time, so I need to keep it plentifully stocked with games. 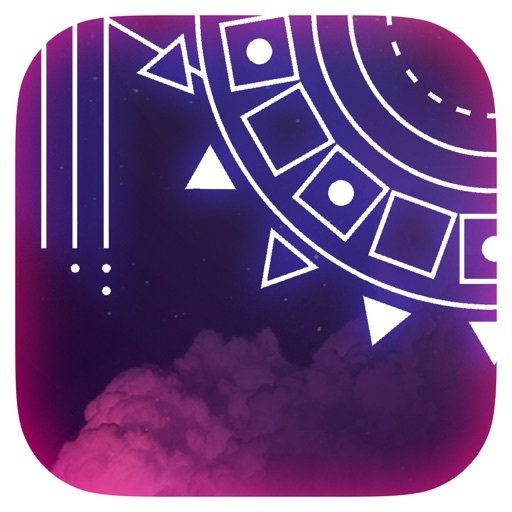 I love faster-paced games that make me think but still have an arcade-like feel to them, so when I saw Swing King & The Temple of Bling on the App Store, I had to check it out. Visually, Swing King carries an awesome 16-bit retro aesthetic due to the pixelated art style, and this definitely takes me back to the golden days of gaming. 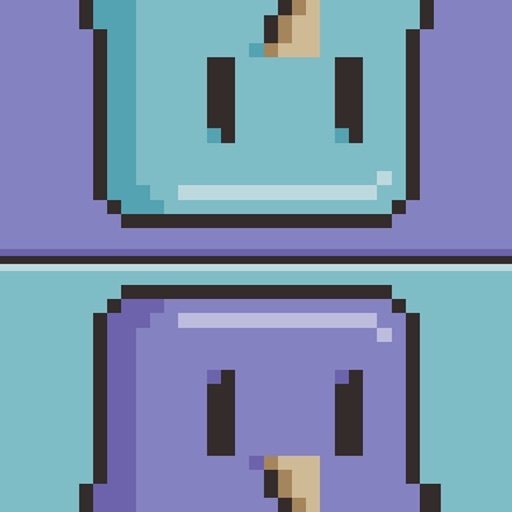 While Swing King has pixel art, it’s modernized so that it looks incredibly smooth, and not jagged like older games. The color palette features a wide range of hues, ranging from bright and vibrant shades to much more muted, earthy tones, depending on the area that you manage to make your way to. Character sprites for Mumbles the Monkey and all of the other critters you’ll encounter on your journey are cute and easy to spot amidst the chaos. Animations are velvety and fluid, with no lag on my iPhone 7. The game also has an upbeat and quirky chiptune soundtrack that is fun to listen to, and just adds to the overall charm of this challenging arcade game. Since Swing King & The Temple of Bling is an action-puzzle game, that means that it is level-based. At the moment, there are 45 stages for players to go through, and checkpoints are available at the start of each stage if you have the coin for it (10 coins to unlock). Since the game is rather seamless when it comes to transitioning between each level, you can’t really go back to a previous stage, which is why the checkpoint system is in place. The one thing that makes Swing King a bit different from other puzzles, though, is the fact that there are no stars to acquire on each stage, nor is there a point system, so you can play the game entirely at your own pace. There are ads that pop up every now and then since the game is a free download, but they are always between levels, so not truly intrusive. 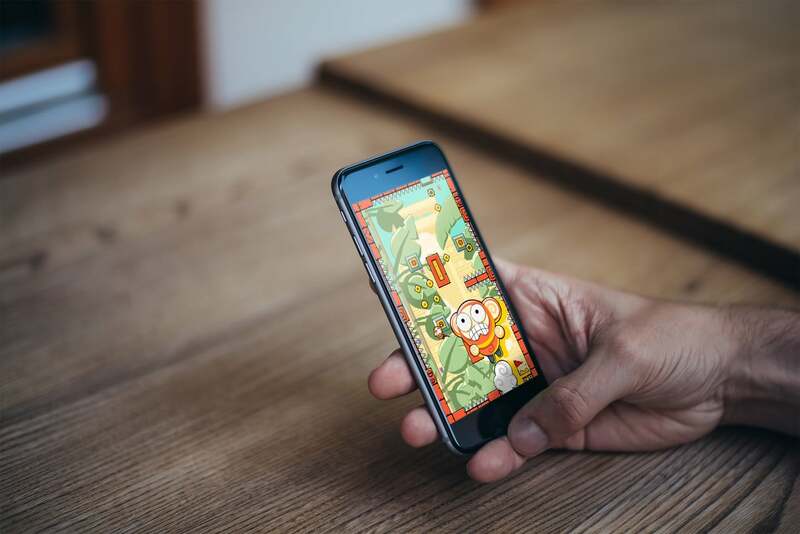 The controls in Swing King are simple and require only one tap, so the game can be played anywhere, anytime. To start a level, just tap-and-hold to have Mumbles swing in from the bottom of the screen. When he flies past one of the squares on the stage, long press on the screen to have Mumbles grab onto the pole in the middle and swing in circles around it. 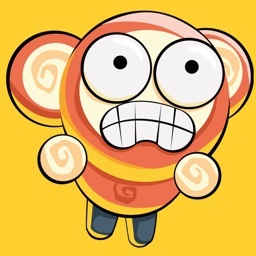 The moment you release your finger from the screen, Mumbles will be sent flying off in the direction he was swinging towards, and this is how you maneuver around the stage. Things start off easy enough, as you’ll swing around and collect the gold coins to use on unlocking checkpoints to save time. However, the further along you get, the more difficult the game becomes. You’ll have to watch out for spikes along the walls, sticky spider webs that hold you in place until you decide to move again, various enemies that will kill you in a single touch, and other dangerous hazards. If you die, you’ll have to start over from whatever checkpoint you paid to unlock, otherwise you’ll start from the beginning. It’s a little annoying, but the gold coins are scattered about generously, so you shouldn’t have issues collecting enough to open a new checkpoint. Swing King & The Temple of Bling is definitely a fun little time waster game that anyone can pick up and play with a bit of downtime. The graphics are cute and delightful, the music is eccentric and stands out on its own, and the controls are intuitive. 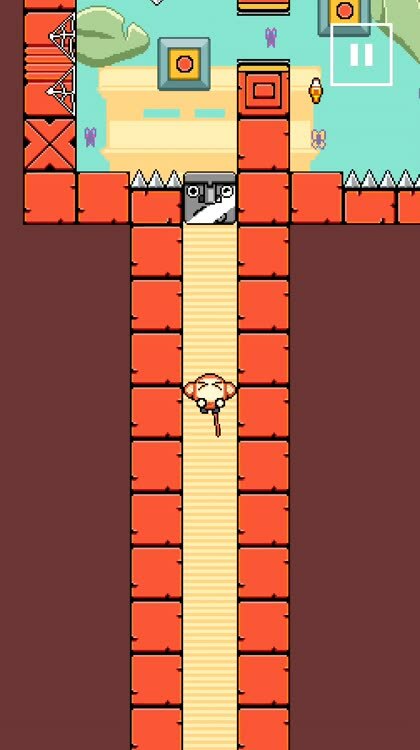 The puzzles start out pretty simple, but as you get further along, the difficulty picks up gradually, and it becomes much more fun as you try to figure out the best route to take in order to reach the passageway to the next area. It’s challenging but not too over the top, so it’s just downright wholesome fun for the entire family. Overall, Swing King & The Temple of Bling is good, but it isn’t without some flaws. I don’t like that you can’t go back to a previous level that you liked, and you have to spend coins to access checkpoints. And while the ads are not too bothersome for me, I can see others possibly having more of an issue with it. 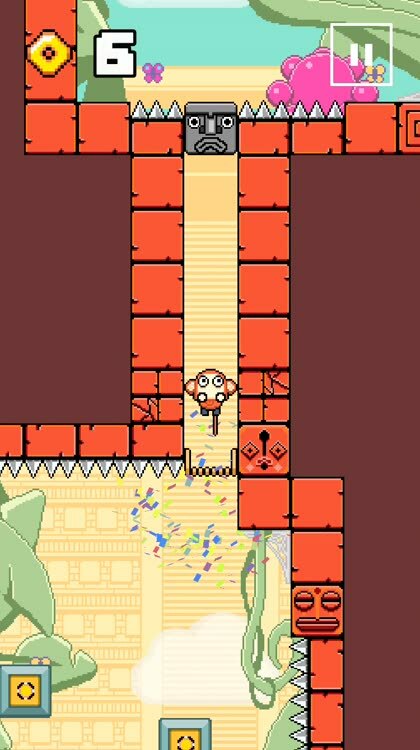 Swing King & The Temple of Bling is a cute and fun little action puzzle game that is sure to captivate many. I love the modernized pixelated style, and the chiptunes are downright fun. The controls are clearly designed for touch screens, and that means that this game can be played anywhere, even while you’re waiting in line at the store. I’m not a big fan of the checkpoint system, but at least the coins are plentiful and it’s not that hard to get at least 10, so it’s not a big deal. I recommend giving Swing King a try if you’re looking for a fun and casual action puzzle game. You can find Swing King & The Temple of Bling on the App Store as a universal download for your iPhone and iPad for free. There are in-app purchases.